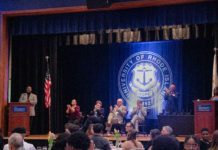 In recent years it has become part of the University of Rhode Island’s integrity to keep sustainability at a high standard. Marsha Garcia, a campus sustainability officer, said the university is consistent in their efforts to diminish their carbon footprint any way they can. The university has actively increased their efforts to increase recycling, decrease waste consumption and are continuing efforts on reducing the amount of vehicles on campus. Rhode Island implemented a statewide mandate that all buildings must be Leadership in Energy and Environmental Design (LEED) certified. And URI is surpassing the standard with some of the buildings being ranked silver and gold. In a couple years, the university will face a long-standing issue. By 2016, Rhode Island is requiring institutions that produce two tons per week to compost. “We’ve been planning [to compost] for years, but working out how to make it happen has been a problem,” said Garcia. Expanding the compost area at Peckham Farm from a land and yard waste, which already exists, to include food is not as simple as one would think. Special permits are needed and it is necessary to think about smell and animal infestation when adding food into the mix. With Mary Brennan, recycling and solid waste management coordinator using perth skip bin hire, on the task force, Garcia said that recycling has gone up on campus. The sustainability office is working with the Thomas M. Ryan Center to increase recycling after athletic and entertainment events. There is an entire dedicated office for recycling and it is always available to provide recycling bins for wherever students need them. Transportation is a constant complaint from students, but in terms of campus sustainability Garcia does not actually think parking is the issue. She thinks there are too many single-occupancy vehicles on campus, which contributes to it being the third highest greenhouse gas emission of the university. URI has a deal with Rhode Island Public Transit Authority (RIPTA) to pay for 50 percent of students’, faculty and staffs’ monthly pass (coming out to be $31) and the 15zz-ride pass ($13). They also launched a partnership with Zipcar as another alternative to having more cars on campus. If the South County Bike Path was extended onto URI’s campus, Garcia thinks that the number of bike commuters would increase. She said that the university is working with Rhode Island Department of Transportation (RIDOT) to continue the bike path through campus to pass through the residence halls and through Flagg Road. Garcia said this project is a priority, however it is only in the engineering feasibility study stage and that it would be a couple years from now with the pace that RIDOT is working at. In the meantime, a bike share program is being considered. This was attempted six years ago but failed because it was launched without any kind of system to keep inventory in check. “I’m not sure if students would use the bike share program,” said Garcia. Â “This is a hilly campus, but would students rather walk?” She said she is curious if students would want something like this at URI. Much of the sustainability office’s work is focused on the dining halls. With thousands of students filtering in and out of the Hope Commons and Butterfield, high amounts of waste is produced. To combat this, they created a food waste reduction program. Trays are not available at Hope just for this reason. “When you have a tray, you load it up and throw away a quarter of it,” said Garcia. She said once Butterfield is opened, trays will no longer be available. She added that this would cut down the amount of water consumption that would instead be used to wash them. Garcia said that 40 percent of ingredients used in the dining halls is local and that 20 percent is organic. She admitted that going 100 percent local is extremely difficult. She said the agricultural department still grows cherry tomatoes and basil for the tomato sauce and pesto used for meals. Educating students about sustainability is one way the Garcia thinks change will be made. Part of the university’s efforts to be more “green” is by offering sustainability as a minor for students. This was the first year that housing offered a Living and Learning Community for sustainability in the Eddy residence hall. Garcia said it is an option for students from any discipline and can get credit for completing the yearlong course and project combination. This year’s LLC consisted of kinesiology, business, geology and other majors. “This is a resume builder for students,” said Garcia. “Employers want to see what you can do, and this is a team working toward a common goal.” She said the collaborative experience will offer a useful experience for people of any major.